Sir Walter Raleigh Pipe Tobacco serves the smoker with a fragrant and mellow taste that is quintessential for an everyday smoke. This Sir Walter Raleigh Pipe Tobacco has a pleasingly sweet aroma, which is designed to satisfy the most fastidious smoker. Raleigh Pipe Tobacco comes only in one type on this website; the original model. 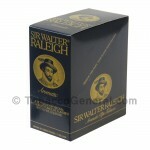 Pipe tobacco found in Sir Walter Raleigh products is exceptional and legendary due to its history of satisfaction of consumers for many years within the notorious market of pipe tobacco. If you’re looking for a breakthrough smoking idea, tobacco is indeed your choice when it comes to saving money and time… especially Sir Walter Raleigh Pipe Tobacco. 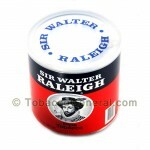 Tobacco General offers Sir Walter Raleigh Pipe Tobacco at the lowest prices among online retailers while offering sealed freshness and taste. Buy this exceptional pipe tobacco now! A mildly aromatic blend of burley tobaccos. Packed in 14 oz. cans to store it for longer time. A mildly aromatic blend of burley tobaccos. Conveniently packed in 6 puches 1.5 oz. each.